Mathematics is the most beautiful and the most powerful invention of the human spirit. Mathematics is as old as humans. Professor Mykhailo Zarichny of Lviv National University, who taught in a prestigious American university for two years, read in one of reputable US research journals that between the two world wars there were three mathematical capitals in Europe: Paris, Hattingen, and Lviv. Surely, it’s an exaggeration, since mathematics developed in other places, too. Considerable results were achieved in Moscow, Leningrad, Kharkiv, Berlin, Cambridge, Warsaw, Krakow, and also overseas. Suffice it to remember the prominent American mathematicians George Birkhoff and Norbert Wiener – the creator of the new science of cybernetics. However, the mention of the Ukrainian city in an American journal is not accidental. This is a tribute of great honor and recognition of merits to Lviv mathematical school. This was the formation period of new mathematics which was marked by the appearance of areas that were considerably different from classical analysis whose elements are the foundation of education of not only mathematicians, but also physicists, engineers, and now biologists, historians, and literary critics. Academician Valentin Yanin, a historian and archeologist, wrote: “History forever lost a brilliant researcher, while mathematics gained one.” Taking into account the political situation in the USSR, not only mathematics was lucky, but also Kolmogorov himself. It is unknown what his fate would have been if he had chosen history. In 1929–31 Bakhrushin together with academicians Tarle, Likhachov, Liubavsky, and many other historians were implicated in the so-called “Academic case” and then the “Case of the Industrial Party.” The outcome was tragic for many of them. In the 19th and the early 20th century two schools dominated mathematics: French and German. Two prominent mathematicians, Henri Poincare and David Hilbert, laid the foundation for its modern kind. In the works of the former, topology appeared as a new mathematical discipline, while the latter, owing to his fundamental works on the theory of invariant values which don’t change in conversions (for example, area, energy, and power), found himself on the leadings edge of world mathematics. In 1900 at the Second International Mathematical Congress in Paris he formulated the list of 23 unsolvable problems of mathematics — Hilbert’s problems. They became a major target of mathematicians’ efforts since that time. Some of these problems remain unsolved until now. After the First World War new areas were rapidly developing in mathematics: the set theory, topology, probability theory, group theory, and tensor analysis. First of all, this was connected with the needs of physics: the theory of relativity and quantum mechanics, and also development of computer science. But one shouldn’t think that mathematics is a servant to other sciences. This is a primitive approach of communist chieftains and propagandists which was used against Soviet mathematicians. The fact is that the science develops according to its own laws. However, even the most abstract areas of mathematics always find use. When in the works of Russian scientist Nikolai Lobachevsky, Hungarian Janos Bolyai, German Carl Gauss, and Bernhard Riemann non-Euclidean geometry was created (by the way, Lobachevsky called it “imaginary”), no one could presume that such an abstract science would find use and proof in the theory of relativity, as well as in astronomy and astrophysics. 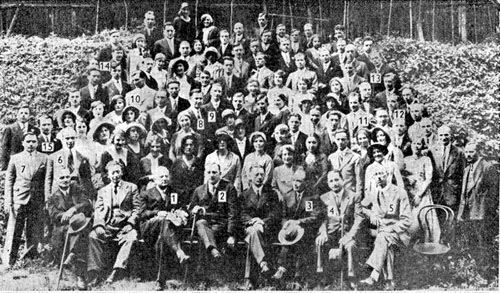 It happened so that a large group of talented mathematicians gathered in Lviv at the beginning of the 1920s. The list of their names is the golden list of this science. Among them were such superstars as Hugo Steinhaus and Stefan Banach. They both were related not only by scientific interests, but also by personal friendship. Stefan Banach (after the establishment of the Soviet Union in 1939 he was called Stepan) was born on March 30, 1892, in Krakow in the family of Stefan Greczek and Katarzyna Banach. His parents were originally from the province of Podhale in the southern part of Poland. The family was so poor that they couldn’t afford keeping a child; therefore, Stefan spent his young years at his grandmother’s, father’s mother. His father never spoke about his mother, despite son’s repeated requests. However, he promised her to give an opportunity for the son to finish gymnasium. Stefan’s mathematical abilities became apparent during his studies, but he wasn’t considered a gifted student. He was regarded as an ordinary child with ordinary abilities. Obviously, it was due to the system of teaching which didn’t reveal students abilities and aptitudes. Unfortunately, Banach wasn’t alone in this case, although opposite examples can also be found. To continue his education, Banach came to Lviv where he entered the Polytechnic Institute. He had not so much to study as to earn his living. Only in 1914 did he manage to pass exams for the so-called “half-diploma” issued after the completion of two years of study. This was the end of his formal education. Banach spent the years of the First World War in Krakow engaged in private tutoring. It’s not quite clear what his fate as a mathematician would have been if it hadn’t been for Lady Luck. In spring 1916 walking down the streets of the beautiful city, Hugo Steinhaus, who was 29 years old at the time and who already was a famous scientist, heard a conversation of two youngsters. The words “Lebesgue measure and Lebesgue integral” attracted his attention. At that time, discussing such problems demonstrated serious knowledge of new areas in mathematics. The youngsters were Stefan Banach and Otto Nikodym, another would-be famous mathematician who lived and worked in Lviv. In his recollections Steinhaus wrote that “Stefan Banach became the most prominent discovery of his life.” The task set to the young mathematician by Hugo was solved and demonstrated in the scholarly world in the form of an article by two authors. By the recommendation of Steinhaus, in 1920 Professor Anton Lomnytsky of Lviv Polytechnic Institute invited Banach as an assistant to the chair of mathematics. The same year he wrote a doctoral dissertation on functional analysis. In 1922 Stefan Banach started working in Lviv University, first as an extraordinary professor and then as an ordinary professor. And all this despite his absence of a complete higher education. At this time, Steinhaus together with professors Yevstakhii Zhylinsky and Stanislav Ruzevych taught there. In 1924 Stefan Banach was elected a corresponding member of the Polish Academy of Sciences and later a corresponding member of the Academy of Sciences of Ukraine. As the Polish and American mathematician Stanislaw Ulam recollected, he got “living” impressions about the mathematicians in 1926 at public lectures in Lviv delivered by Steinhaus, Ruzevych, Banach, and others. Ulam himself was 16 years old, but he was impressed by the young age of the already famous scholars. In his mind professors of mathematics had to be grey-haired aged people. Open any handbook or monograph on functional analysis, the unit of mathematics where infinite dimensional areas (mainly function space) and their reflections are studied, and literally on every page you’ll see “Banach area,” “Banach operator,” “Khan-Banach theorem,” “Steinhaus-Banach theorem,” and it’s just a part of an endless list. His methods and ideas greatly influenced the development of this most important branch of mathematics. They are relevant, and even more important, in our time. The classical work by Banach The Theory of Linear Operations was published in Polish in 1931, in 1933 in French, and in 1948 under the title The Course of Functional Analysis – in Ukrainian. In Russian his course Differential and Integral Calculus (1966) is well-known. The minimum of works we mentioned is quite enough for Banach’s name to enter the history of science. But his no less important merit was the fact that around him and Steinhaus a unique community of mathematicians was formed – the Lviv School of Mathematics. A unique and thrilling episode from the great scientists’ lives is connected with it. As Ulam recollected, first they gathered not far from the university in Roman Cafe. They played chess, drank coffee and beer, and, most importantly, meditated about mathematics. They wrote formulas with indelible pencil on tables’ surfaces. After he moved to America, Ulam introduced the same tradition while working in Los Alamos, but instead of cafe tables they wrote with chalk on blackboards. The owner didn’t like this use of equipment and therefore the company moved to Scottish Cafe (Kawiarnia Szkocka) across the street. The cafe was located in Academic Street, currently Shevchenko avenue. The cafe wasn’t preserved, and now there is Universal Bank there. Unfortunately, this historical location is not marked by a memorial plaque. The city of Lviv would have to be proud of it. In Scottish Cafe the story repeated. Indelible pencils spoilt marble tables, and the owner of the cafe complained about it to Banach’s wife Lucia. Either she or Banach himself brought a big office book to the cafe. In Soviet times they were called “stock books.” On odd pages they formulated unsolved problems, and on the opposite side, on even pages, solutions to them. Discussing and solving problems also took place in the cafe. Once mathematicians were talking 17 hours non-stop as they were so much engaged in solving a problem. The book was named Scottish. When the cafe was closed, the book was given to the owner, who treated it very carefully. Evidently, he understood its historical value. Steinhaus told that the table where Banach and Ulam sat was in the center of the cafe. They discussed everything: from theatrical performances to the international situation. The famous mathematician Kazimierz Kuratowski who taught in Lviv Polytechnics in 1927–33 often visited them. His most prominent results were achieved in topology (Kuratowski’s closure axioms, Knaster-Kuratowski fan, Kuratovski’s theorem). To discuss the most important problems with colleagues, the founder of the Warsaw school of mathematics, Waceaw Sierpinski, and prominent mathematician John von Neumann personally came to Lviv. The proof of the Banach theorem was obtained precisely in this cafe. Unfortunately, the Scottish Book wasn’t there yet, and the proof was written on the surface of a table and erased by an usher. It can’t be restored so far. Other important results achieved by Banach and his students had the same fate. On the one hand, they didn’t have enough time to write theorems and their proofs. On the other hand, a solved problem lost attraction but generated a new problem and everyone tried to solve it. Oral communication was most essential, while articles and priorities were secondary. When this book appeared, the situation became more organized. As a reward for a solution of a very difficult task, for example, a goblet of beer, wine, or supper at a restaurant of fashionable Hotel George was offered, and for the most difficult one, which was suggested by Stanislaw Mazur, a close friend of Banach, the author promised a gander. This problem (number 153, dated on Nov. 6, 1936) was solved only in 1972 by the Swedish mathematician Per Enflo, and he got the promised reward in Warsaw. The prize was cooked for him by wife of the Polish mathematician Zhyliasko. The total of 193 mathematical problems were recorded in the Scottish Book. Banach wrote 14 problems there (and 11 more together with Mazur and Ulam), Ulam 40 (plus 15 general ones), Mazur 24 (and also 19 general ones). The first record was made on July 17, 1935, and the last one on March 31 (according to Ulam, on May 31), 1941. By the way, record number 193 contains a set of not very clear results signed by Steinhaus connected with the distribution of matches in a box. This problem was generated, on the face of it, by an ordinary problem, Banach was an inveterate smoker. In order not to look for a match, he had in his left and right pockets a box, which he randomly got out. The question was: what is the probability that if matches run out in one box, the other will have k pieces or, in a more general case, no less than k pieces. The solution is not as easy as it looks at first glance. No wonder Steinhaus’ records were difficult to make out. It’s interesting that this is one of the first tasks which led to the appearance of a new mathematical discipline – the mass service theory. Similar problems are encountered in game theory, physics, theory of algorithms, mathematical linguistics, power industry, and so on. The great are always like this. Even their everyday problems help moving science forward. The Ukrainian mathematician Myron Zarytsky often visited Scottish Cafe. His research interests encompassed problems of the set theory, the algebra of logic, and the theory of real variable functions. Besides, he left works on the history of science: Astronomy in Ancient Times (1935, in Polish), A Reader of Greek Mathematics (1936, in Polish), and the article “Remarks to the Problem of Approximate Calculus in Greek Mathematics” (1974). He knew foreign languages: besides Ukrainian, Polish, and German (which each Lviv intellectual knew), he also knew French, Yiddish, and Hebrew. He published his articles in Italian and Spanish. It was he who translated The Course of Functional Analysis by Banach from French into Ukrainian. When in the summer of 1939 Ulam was in Lviv for the last time (he worked at Harvard already), they discussed with Mazur the probability of the beginning of a new war. Mazur said: “Perhaps, a war will begin. What shall we do with the Scottish Book and our unpublished works? You’re going to the United States and will probably be in safety. If the city is bombarded, I’ll put the book and manuscripts in a box and bury it under the ground.” At the time, they agreed that he would bury the box near the gate of a soccer field. For a long time the book was considered lost, but Banach’s son found it and in 1957 sent a copy to Ulam. He translated it into English and made a report for the Mathematical Congress in 1958, where it became a sensation. The traditions of the Scottish Book are continued — since 1945 new records have been entered. After the war the original of the book was passed over to Banach’s wife and later to his son. In the 1980s it was given to the Institute of Mathematics in the Polish Academy of Sciences and is kept in the Banach center. In 1981 its second and edited version appeared, where the state of the mathematical problems that appear in the book is discussed, as well as their development and solution in the following years. The edition is supplemented with historical commentaries. When the Red Army occupied Lviv, this had almost no impact on mathematicians. Lectures could be delivered in Polish, Ukrainian, or Russian. But they were ordered to initiate a socialist competition between chairs on the quantity of new formulas, publications, and inventions. In mathematical books, forewords dealing with Stalin Marx, Engels, and Lenin and their big contribution to the research on functions, matrices, sets, integrals, differentials, N-spaces, etc. became mandatory. Stalin was an inspiration for inventors, the all-knowing genius in any sphere of knowledge. He had to be recognized as the most knowledgeable authority in mathematics as well. “Never mind, it’s like this here only now, and we had it all our life,” consoled Steinhaus one of Soviet mathematicians who came to Lviv for a conference. As always, someone was found who started cooperating with the new government. Leon Chwistek, philosopher and mathematician, since 1930 taught in Lviv University and actively cooperated with the Soviet government, particularly, with the pro-Soviet newspaper Czerwony Sztandar. He published a few texts glorifying the Soviet government and Stalin. In June 1941 he was evacuated from Lviv together with the Soviet troops. In 1941–43 he taught mathematics in Tbilisi and then in Moscow. He participated in the Communist Union of Polish Patriots and died in 1944 in the Soviet capital. Havoc came in the period of German occupation. Among mathematicians there were a lot of Jews, and their fate was tragic. Banach was very much humiliated. Fascists used him as a source of blood for lice. They prepared anti-typhoid vaccine this way. After liberation Banach again became the dean of the mathematical department, but in August 1945 he died. He was buried at Lychakiv Cemetery. At the end of 1941, Steinhaus gave away his Polish passport to his acquaintances and became a peasant. He changed his appearance so that he looked like an organist of a church and moved to the village of Zymna Voda near Lviv, or more precisely – to its most desolate part – Osychyna. There, he led a miserable life together with his wife, but felt happy that they managed to save their lives. Throughout entire German occupation Steinhaus was in the village, gathering dry branches in the forest and not addressing any authorities. He didn’t have provision cards or cards for some essential commodities. Since 1943 he secretly gave lessons of French, geography, and of course, mathematics. Steinhaus survived the war, but lost many relatives. And the heritage of the Lviv School of Mathematics revived in Warsaw and Wroclaw. Steinhaus recollected later that under the Soviet regime he actually wrote just one mathematical work because of the stupidity of Soviet functionaries, while during the Germans none, because of the constant fear for his life and the threat of annihilation. Everything is learned in comparison. In the heyday period of the Lviv School of Mathematics, during free discussions of mathematicians on problems beyond scientific ones, the tragedy of Soviet mathematics was unfolding in Moscow. At the beginning of the 1930s they fought with professor Yegorov – “yegorovshchina” (“Yegorov movement”). Six years later it was the turn of his student Nikolai Luzin (“luzinshchina”). Ulam remembered that during a meeting in Zurich the future academician Pavel Aleksandrov invited him to Moscow. But the Soviet consulate in Lviv rejected his application for a visa — evidently because of his cooperation with the “reactionary” professor Serpinsky, a friend of Luzin. The Lviv School of Mathematics is our great history. It is created not only by politicians and military leaders, but also by great scholars, though, unfortunately, people know very little about their achievements. The city of Ivan Franko is also the city of Stefan Banach and Hugo Steinhaus. They are the pride of Ukraine and Poland and our common history.